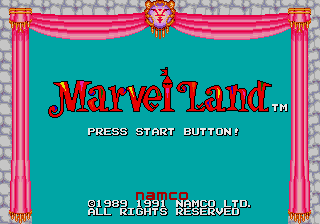 Marvel Land (マーベルランド) is a 1989 arcade game by Namco ported to the Sega Mega Drive in 1991. In Europe it is known as Talmit's Adventure. Marvel Land is a popular amusement park atop the mountain Peace at the heart of Coni, a land where many different beings live in harmony. One day, Mole, the king of the "under dwellers," took over Marvel Land by imprisoning the four fairy guards in crystals and kidnapping the Princess Wondra. You are Prince Talmit, who sets out to rescue them all and free Marvel Land. and jump; jump on enemies to destroy them. Throughout the levels, you will find various powerups; use (and in some cases, / ) to use them. You lose a life with one hit or when running out of time. Main article: Marvel Land/Magazine articles.